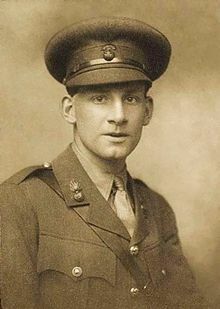 Sassoon himself was pretty far from being a coward - he was a war hero known to fellow soldiers as “Mad Jack” because of his persistent practice of venturing into no-man’s-land to raid the German trenches by night, crawling through the barbed wire, revolver in one hand, knobkerrie in the other, and three hand grenades in each pocket, apparently not caring whether he got back alive. During the Battle of the Somme, he had charged a German trench single-handed, down a slope, across a railway line, and up the opposite bank: the Germans thought it was a mass attack and fled. He won the Military Cross for rescuing a wounded man under heavy German fire, and was recommended for other awards. He was in England to write that letter because a German sniper’s bullet had hit him in the shoulder, missing his jugular vein and his spine by a fraction of an inch. He was prescribed treatment at a convalescent home at Craiglockhart, near Edinburgh, and it was here that he first formed a friendship with an admiring Wilfred Owen. Sassoon returned to the front, but in July 1918, as he was returning from another of his dangerous excursions into no-man’s-land, when he decided to savour the dawn of a beautiful summer’s day by removing his helmet and standing up to gaze at the horizon. He was shot by a British sentry who mistook him for a German; but with his usual luck, he survived, and lived to be 80. What an incredible man and what a poet. But why would we bother to listen to the testimony of those who actually fight our wars, eh? We might actually learn something. Let's just call them all heroes and keep sending them off to die anyway.